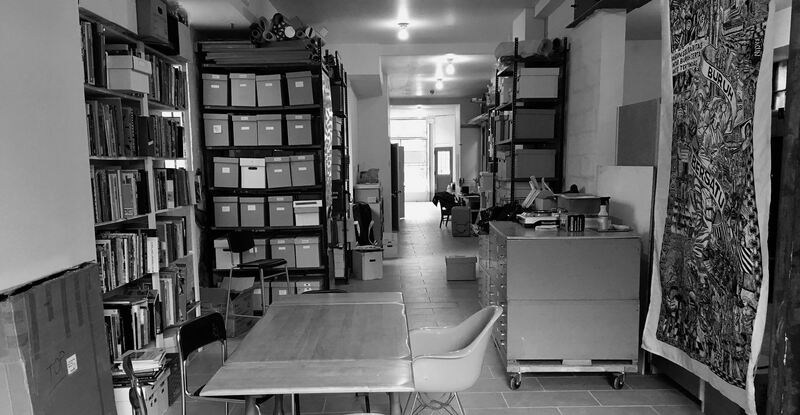 The Archivists Round Table of Metropolitan New York (ART) and Interference Archive invite you to a special event at the archive's new home on 7th Street in Brooklyn. Interference Archive is an all-volunteer, grassroots archive of social movement cultural ephemera. Founded in 2011, the archives evolved from the personal collection of two of its founders, who amassed an extensive body of materials through their involvement in social movements, DIY and punk, and political art projects from the 1980s through today. Since then, the collections have grown substantially through regular donations from over 200 donors. The goal of Interference Archive is not just to focus on collecting physical material, but to engage with the materials in ways that build community and allow for a better understanding of our history and the times we live in. Volunteers curate several exhibitions per year, create exhibition publications, produce a bi-weekly podcast, host regular programming events, catalog our collections and assist researchers. Through all of this work, Interference volunteers use cultural ephemera to animate histories of people mobilizing for social transformation. Interference Archive considers the use of its collection to be a way of preserving and honoring histories and material culture that are often marginalized in mainstream institutions. This event will provide ART members and guests an opportunity to learn about the work of Interference Archive and to interact with our open stacks collection. Following a short introductory presentation to Interference Archive's practices, policies, and community, we'll look at some collection highlights and engage in a Q&A discussion about how all this work is possible and what impact it has. The event will be followed by a social hour and refreshments. This event is currently at capacity. Please contact Amye McCarther at programming@nycarchivists.org to be put on the wait list. Interference Archive is an ADA accessible space.